This is the Phocea Blend brought to you by La Colombe. Unforgettably dense, Phocea is best described as raw and full-bodied. Phocea lends itself to nearly every coffee brewing method, from French press to drip to filter coffee to espresso. This cup is fantastically full bodied, with smoky, spice and earthy notes. Not the biggest fan of the black pepper finish on this one. Ended up with a mixing the beans with a darker roast for a more balanced cup. this is as described smoky and earthy with a bitter aftertaste. It has an attractively strong initial flavor in the French Press, which was surprising given that the beans aren't "shiny" like most dark roasts. But the finish is weak, and I'm not a big fan of the peppery finishing taste either. Like for the first coffee, I finish it wishing for more richness, which seems to be about sweetness for me? (Espresso was better for the first coffee). I'm adding this information after receiving your email, answering each of your specific questions. Please all of these types of questions you can to help me get clearer on what I like and don't like. Was the Phocea Blend better or worse? ---- I'm doing the ratings relative to how likely the coffee is to replacing the Starbucks Espresso roast I favor. So, a 3 means that while ok, the coffees so far wouldn't compete at all. A 4 would mean "damn, pretty close, maybe I'd switch out for this." A 5 would mean, "this is my new coffee! Was the coffee acidic or sour? Was the color of the bean lighter or darker than what you typically enjoy? ---lighter. All past roasts that have this light brown, non-oily look have been too green for me. That is why I was surprised that this one actually had a strong beginning. The SB roast I like is very dark and oily - but so was the double dark you sent first, and so have been other strong roasts (French and Italian) that I've tried, but have always returned to SB-Espresso. Produces a HUGE full bold taste, but so balanced and smooth at the same time. Excellent. This blend is at the top. Love this. Perfect roast level. Maybe a little too peppery, but otherwise perfect. Very strong, different...but I very much enjoyed this one. This one was a pleasant surprise that we loved...it is rich and earthy and unlike the coffee we usually buy! Excellent roast and a nice contrast to the Good Folks. Deep, dark and bold I am enjoying the Phocea Blend's almost smoky palate. It does not have the (really) amazing roast caramel nose of the Good Folks but I like the bolder finish when drinking the Phocea Blend. Great body. I typically like a sweeter bean than the Phocea. Less earth, more caramel/burnt sugar, etc. But this definitely made a nice cup of coffee. We really like this blend!! We especially like the spice aspect and how full the flavor is. Unfortunately I didn't review this coffee when I was drinking it. I liked is a little less than the Double Dark Blend, but much more than the Anodyne coffee that came after it. From what I remember it was a good full bodied coffee and lent itself to Chemex brewing, which is my preferred method. i have a different coffee from whats pictured here? pretty dark, and not too strong. taste kinda tangy as an after note though. Very good, but not quite as good as my first. It was good but still prefer the black and tan. The smokey desctiption leads one to think over roasting. The best so far... well-rounded, shells and nuts, some chocolate. And I don't mind even more full bodied.But not a huge fan of the pepper part. I prefer it in my bourbon more than my coffee. Really smoky, almost tobacco like. It's a nice coffee with interesting flavors different than I've had before. Excellent taste start to finish. Initial deep, dark chocolate coffee opening. Smooth, rich flavor transition to a lasting earthy, almost light oakey finish with an excellent coffee aftertaste. This roast hit many high notes for me. The aroma is good, the flavor is bold and the texture is rich and full. The roast just a tad darker than I prefer - and one of the issues from that is that the beans are little oily, which makes them stick in my grinder. Even despite that I am finding this to be a very good, enjoyable coffee. The color of the bean was right on to what I normally expect, however the taste was a little more bitter than I prefer. It wasn't bad, but not my favorite. This is an interesting coffee. It has a nice flavor and a bit of astringency. It definitely has a spicy quality that I have not come across before and at times has a cinnamon taste to it. The crema on the shots have been inconsistent and are typically a little thinner that I would prefer. This was pretty good when I made it as pour over, but I mostly do espresso, which is when I didn't think it shined. Really not a fan. Anything peppery will probably not be a winner for me. Very smooth. Enjoyed the full body of this. One thing that could be better is to have a hint of Carmel flavor. This stuff is fantastic! Delicious, rich, multi-layered. Even when it's not brewed very strong, it still delivers a very complex array of earthy, chocolately flavors. The roast makes for a rich, bold flavor that is potent yet not overpowering. I strongly recommend giving this one a try! Excellent coffee. Stayed fresh the whole time the bag was open, which isn't always the case. Jeff liked this a lot, Jessica, not as much. I can't describe why, other than I didn't find it as well balanced and smooth as the Dillano's. This coffee is great. I can't figure out why, but I like the Metro French better. Good. Not as good as the Italian Roast. Nothing impressive... Lacking flavor or distinction. Very Disappointed. Much better than earlier ones. I'd love to get a mocha java blend soon. favorite, even my husband will drink it black! "Balance' is a good word. First shipment for me, very basic flavor wise but good enough. We enjoyed this blend. Definitely more body and full flavor. Thank you. Love this one! Rich and smooth, dark and not bitter. Awesome in my French press. I couldn't pick too many flavor notes, but I'm pretty new to specialty coffees. Thanks, this was a great first pick -- can't wait to see what you else guys have in store! This coffee is exactly what it promises to be - full-bodied, smoky and earthy. I did feel a bit ambivalent about the first cup I tried, expecting the flavors to be a bit more nuanced, but I have since brewed several more cups, and with each cup my opinion has improved. La Colombe's Phocea Blend is bold, straightforward coffee. I really like this coffee! Some of the coffees I have recieved have been a bit bitter/acidic for my taste. More smooth and full bodied coffees like this would be appreciated! This coffee has very little flavor even after.a generous portion of coffee versus water. Good coffee. Not as intense as I would like it. I prefer dark, intense.. but not bitter. This was a much better coffee than the first month, but didnt blow me away. This wasn't our favorite. It has very little flavor for a full-bodied coffee it also left a bitter after taste. Great body. Zero bitterness. Best cuppa I have had in a long time. Excited to explore more palates. "Unforgettably dense... Raw and full bodied. "I'm not a coffee connoisseur nor would I consider myself very versed in specialty coffees. I use a French press as my brew method. This coffee is definitely unforgettably dense, raw, and full bodied. A little strong for my taste, but still a very enjoyable cup once I was able to find a good balance in my brewing ratio. The aroma is amazing from this blend. Beautiful "cream" on top when made with extra hot water in a French press. Great flavor. Good aroma but lacks complexity on the flavor. While a delicious blend, I feel that this coffee is missing something. Very smooth with a nice round flavor. When you said unforgettably dense, you weren't lying. However, I loved it! The richness and drinkability was awesome. Once again very impressed with the choices. Almost finished with this bag in perfect timing for the next cup. This coffee had great flavor and body. Great strength and flavor with high amounts of caffiene. Excellent selection. Easily drinkable, smooth, and definitely good in a French Press. Just need something a bit more lively. A little too bitter for our tastes... tasted a bit burnt. I've really enjoyed this on both Melitta pour over and my Chemex. Bold, burnt caramel, bitter dark chocolate and blackberry notes. Wait... this is what coffee should taste like? I am still new at understanding the different terms for coffee. I tended to like the darker roasts I bought at stores but none of them have been like this. Not sure if my previous coffees have been just "bad" earthy/full or had different traits I don't like. Good choice for the first coffee. Pretty solid, robust blend. Looking for a slightly stronger finish. smooth cup, I definitely smell a strong earthy scent. easy to drink. but to me I think I would've liked a juicy note in there. looking forward to the next shipment! I'm not sure if it's the earthy notes that the description mentions, but this coffee isn't quite what I was expecting. It's good, and I enjoy it; it's just not as smooth (I think that's the word I want) as I wanted. Excellent. Too strong for my wife's taste. Would like something bold, but smoother if possible. While it's better than generic supermarket coffee, it's not by much. There is a qualitative difference in that it is richer and more dense, the flavor notes that I picked up were that of a stale ashtray. OMG! I love, love, love this coffee!!! So amazing! It's so much better than Starbucks!!!!! !It's smooth and perfect for my taste buds in the mornings or just for an afternoon boost! 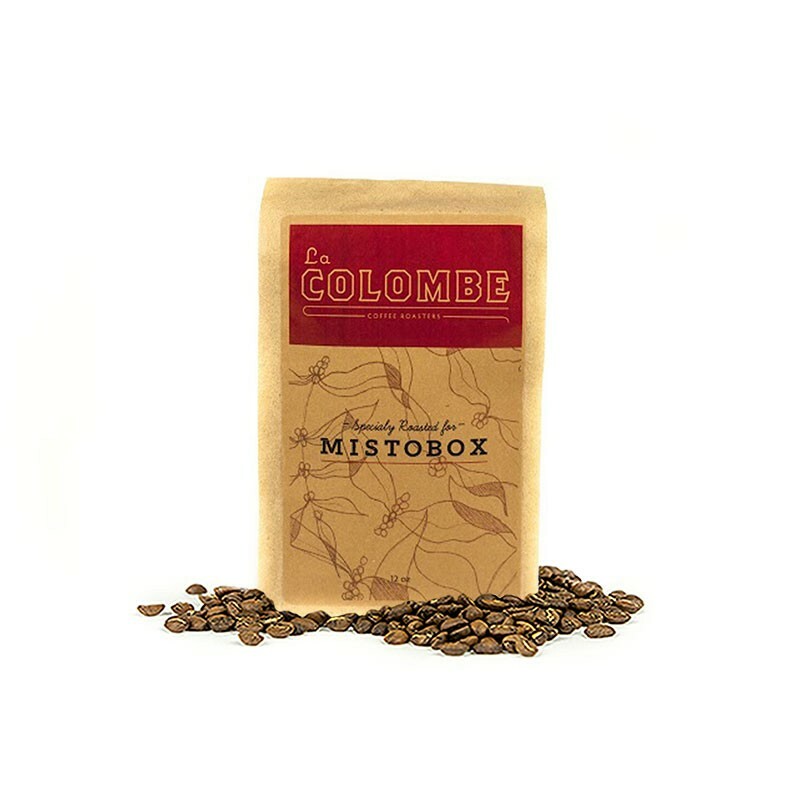 Look forward to trying out different coffees from Mistobox! Thanks guys! I really like this blend, I could smell it before I even finished opening the box when it arrived. It makes a good strong cup and is great for iced, hot, or in a latte. I loved the dark and bold characteristics. However, I would prefer a little less "earthy" or "smokey". Instead, I prefer notes like carmel, cocoa, nuts or toffee. This coffee was perfectly executed (I give it a 5 for that). I just like a little less earthy, so it was a 4 for me. This was my favorite blend in my current MistoBox. This smoky, bold and rich blend still managed to be balanced and smooth. This is what I would expect from a "wake up and go" morning cup, yet still refined enough to enjoy later in the day. I would order this lovely, dark blend again. Enjoyed this very much. Nice dark, full-bodied brew. Lovely dark roast that hits all of the notes and provides a smooth, non-bitter cup of coffee. Really solid blend but maybe a little more dark or bold than i prefer. Overall very please though. As described, lovely in the French Press. I'm sure espresso lovers will love that blend, but personally I find it too strong and lacks some of the flavor so look for in my ideal cup of coffee. Much as described. Weirdly, my wife and I both thought it seemed light on the caffeine when we spoke a few hours into our respective days and compared notes. This is a pretty good coffee but we prefer a bit more depth to our roast. Admittedly, it can be hard to have a dark roast that isn't bitter, but this one is just a bit lacking on the end note. Still a smooth and very drinkable cup!! Really good coffee, we went through it with in a week! I had a difficult time finding the right balance in brewing a cup of this coffee. Came on too strong - something lighter next time. Very mellow coffee. Well balanced not as full-bodied as I would of thought it would be.